Enough said, here we go again. 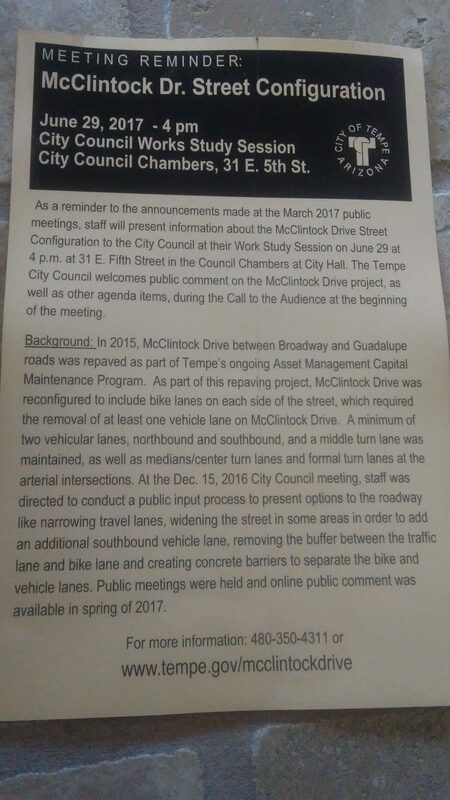 It will be interesting to see how this meeting transpires, whether citizens will actually get an opportunity for public comment, and whether Tempe Council really gives a darn or if this is another part of their charade. Regardless, be part of the process. Send an email, speak at the microphone (don’t be afraid, Council will stare at you because they have to but they don’t bite), or post on the Councilmembers’ Facebook or Twitter accounts (if they haven’t blocked you). By staying involved Council is more likely to be transparent in the future. It appears Robin Arredondo-Savage might be getting that message. We must be honest: At 4:58 pm today, June 24, 2017, there was a biker IN THE BIKE LANE between Baseline and the 60! Will that be enough bikers to keep those candlesticks?